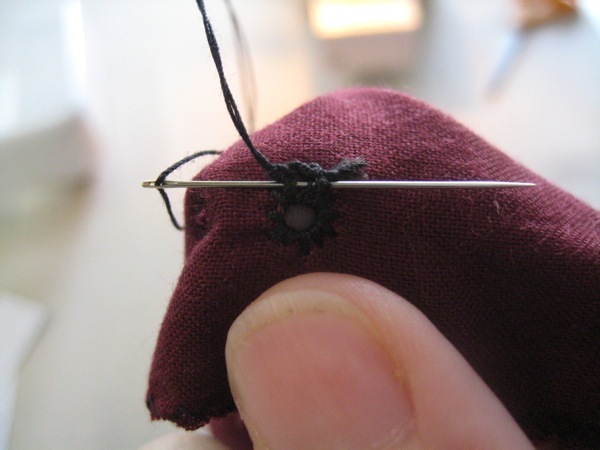 Hand working an eyelet with a buttonhole stitch is surprisingly fast and easy. Hand-worked eyelets are strong, easily sizable, don’t fall out, and most importantly, you never find yourself running out of the color you need at 3am. Finished eyelets, front side shown. Size: 1/8″-1/4″ inner diameter. Outer Diameter depends on stitch size. Figure out where you'd like your eyelet. 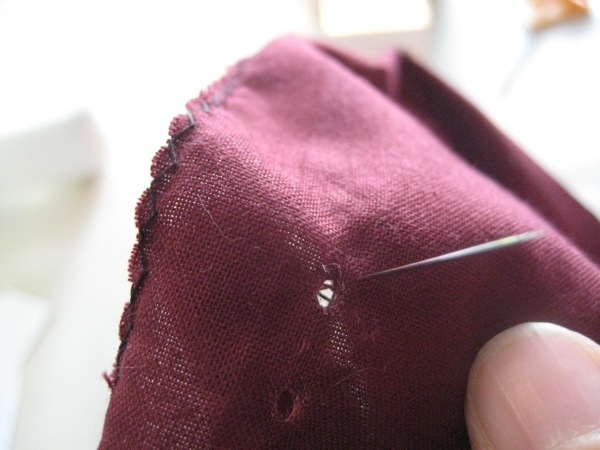 Poke the Awl through the fabric. This leaves a hole where the threads have been pushed aside. Eyelets go faster if you use heavier thread. I'm using Topstitching thread. I find it easier on the hands than upholstery thread and less fussy than embroidery floss. Starting with the needle in back of the fabric, push through to the front. 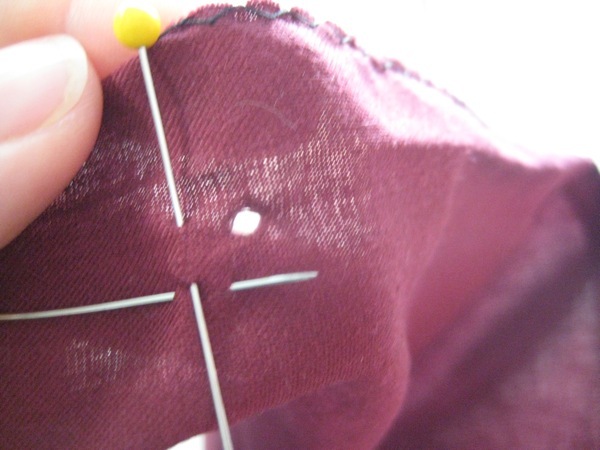 Push needle back up to the front of the fabric, close to your original stitch. 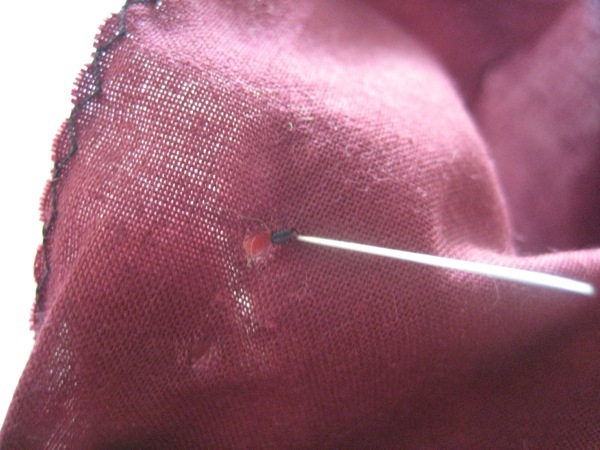 Buttonhole Stitch: Pass needle through hole to back of fabric, then up to front. 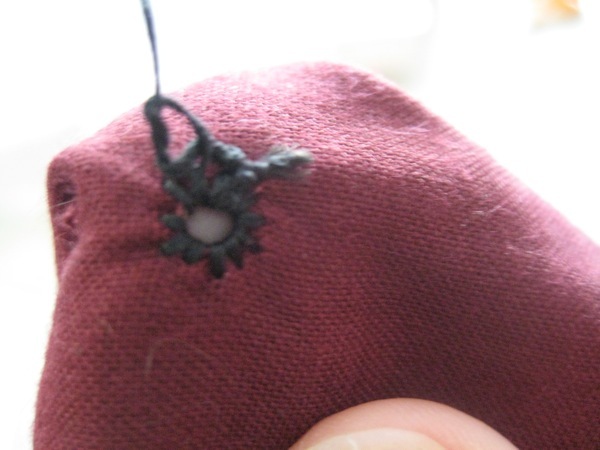 For a small eyelet like this one, I'm working about 4 threads from the hole and 4 threads over from the last stitch (clockwise) Pull thread end under tip of needle, then around the top before pulling needle through. Pull tight. Lather, rinse, repeat. You can see the effect of that thread-wrapping business: because the thread is brought under the tip of the needle, each stitch makes an L shape, which gives our eyelet a neat broder. 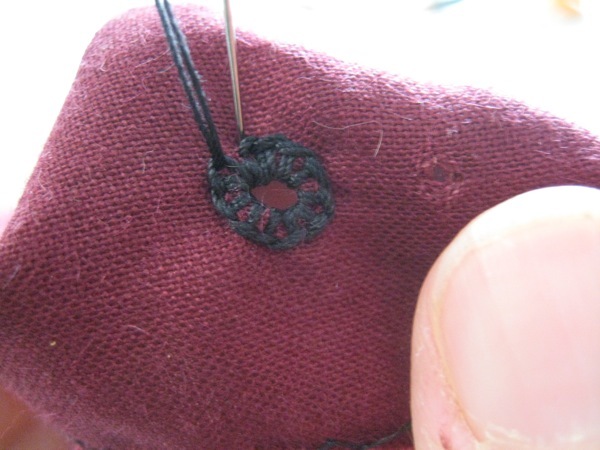 To end, make a small stitch to connect the ring and pass the needle through to the back side of the work..
One of the things that really slows you down when you’re sewing by hand is knots. I don’t mean the kind that show up in the middle of the thread uninvited (though those are a bugger too). I mean the kind that you have to tie at the end of stitching so that it doesn’t all come out. I was taught a fussy little method with a short stitch, a loop, cutting long ends, a square knot, and cutting the ends. That’s, like, fifty-two time consuming steps and I was forever making the first cut too close and having to tie the knot with these microscopic little bits of thread. 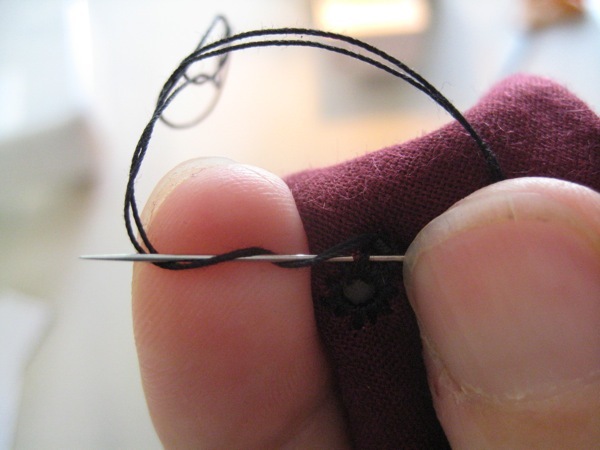 In back, pass the needle under an existing stitch and wind the thread around the needle 2-3 times. This will make a knot. 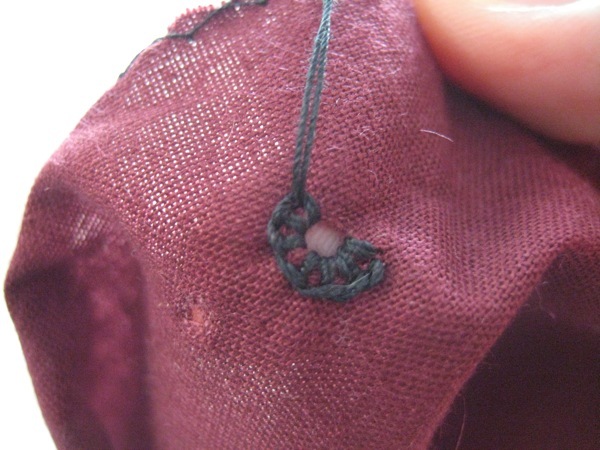 Pull the thread tight, being careful to keep the knot close to the fabric. 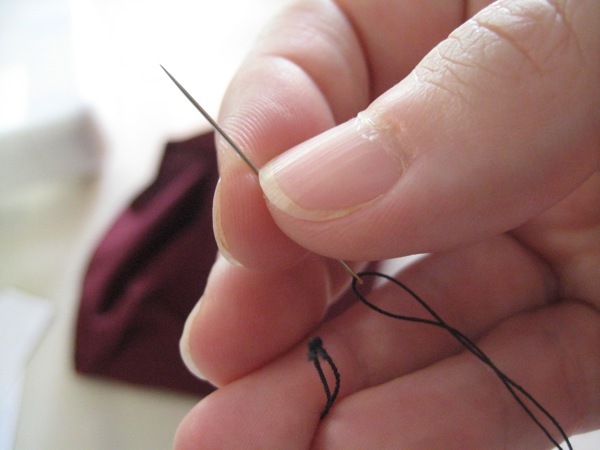 Pass the needle under the threads of a few existing stitches. Pull tight, then snip the tail close. 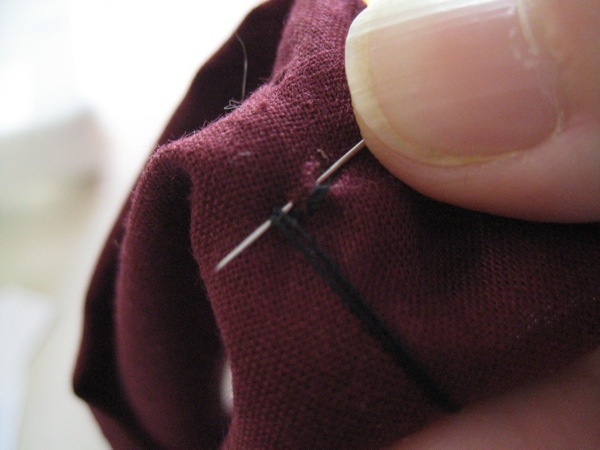 This last stitch secures the thread tail so you don't have little pokey-threadsies. A secure thread tail is a happy thread tail. Finished eyelet, from the right side. Thank you so much for this well written and wonderfully illustrated explanation of how to make eyelets by hand. I’ve been trying to make historic doll clothing that is more “authentic,” and my latest project requires an enclosure with lacing. I hatehatehate setting metal grommets, and find that they don’t always look that good even when properly set. I am going to try this method and see if it’s more to my liking. I’m so grateful for generous crafters and artisans like you who freely share your advice and tips on the internet! thank you so much for this tutorial! i’ve been sewing for 54 years, and have never heard of your knotting method. you can bet i will be using it from now on! Sande – I’m so glad you found something you liked here! Christine – Thanks for the great thread info! Shockingly enough, all of those are in little drawers in the workroom, and I am using a thicker thread in the demo. 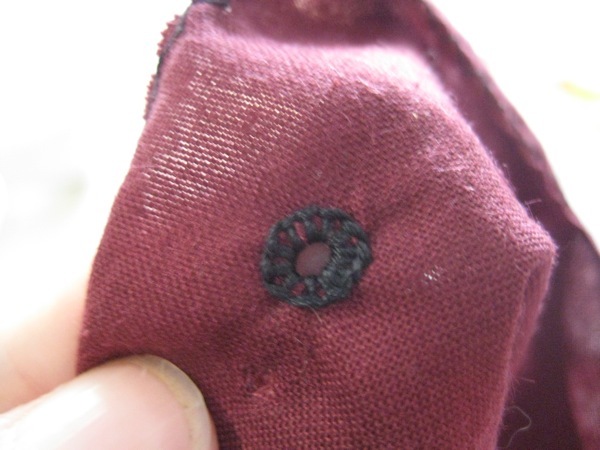 ;) I’ve noticed, over the years, that people come up with a lot of reasons for not trying handworked eyelets. I chose not to add “I don’t have the right thread” to the mix. I used it for too many years to want to pass it on. My goal is to make all this sewing and patterning junque that I do accessible to people who want to learn it. *laugh* If you know that much about threads and thread substitutes, you did’t need this tutorial. Thank you very much for taking the time to add information to the tutorial. I appreciate it, and I’m sure other readers of the site will to! Missa, I value this tutorial very much! Perhaps those that know “a better way” could take time to make a turtorial also? I doubt that will happen… Most can read it like I do, and not worth your time to respond. So please, keep on keeping on! And a great big THANK YOU! 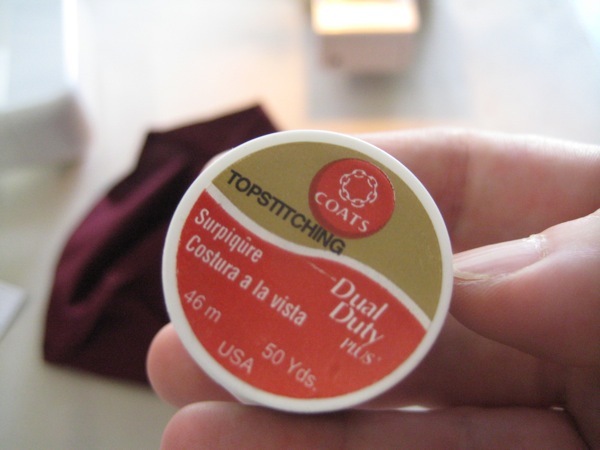 Wait, why would it be bad form to hand-sew something that wants extra reinforcement using a doubled thread? I’ve heard about prohibitions like that in some schools of thought, for instance I think couture sewing, but I’ve certainly read plenty of references to doubled thread in various sources from various time periods. The main thing I come up against is that many modern people are suspicious of the strength of hand-sewing and tend to feel the need to use extra thread (doubling it when it need not and/or ought not to be doubled) or extra knots, when they aren’t necessary – but that doesn’t make it actually bad form to use a doubled thread when you’re doing something that, well, wants a doubled thread. Why do you say it’s bad form, Christine? Love the tutorial, Missa. I will have to experiment with your knot technique! I think I do something similar, but this seems like a nice little trick. Thank you so much for this! 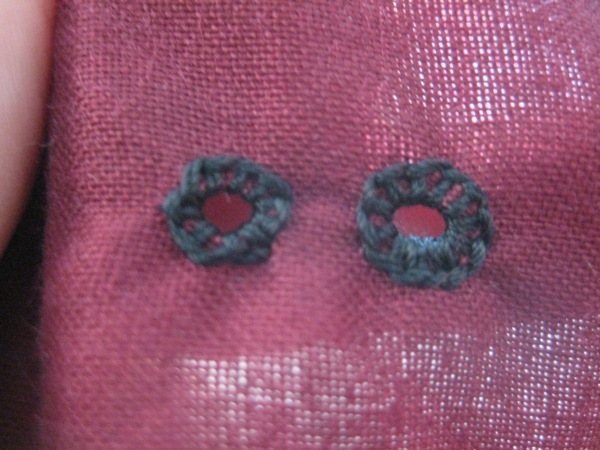 Have just done my 1st hand stitched eyelets ever. 1- each thread pulls at a slightly different tension, making it more troublesome to get the threads to lie neatly, and the threads tend to tangle around each other as you stitch, also making it more troublesome to get them to lie neatly. Keeping the tension even on both threads, and keeping them from twisting at the edge of the eyelet, takes a bit of practice. 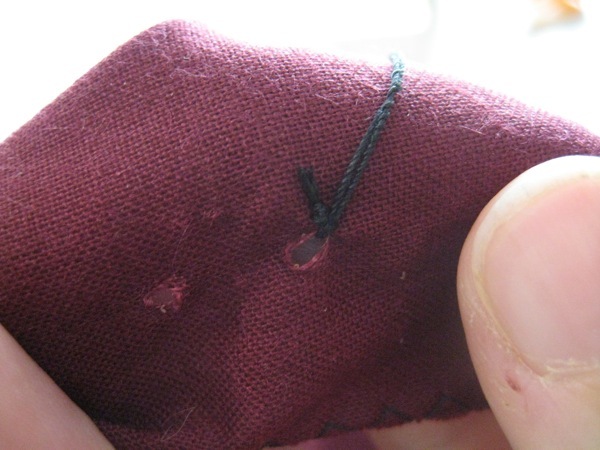 I’ve been sewing things the “wrong” way since I was very little (maybe 5? ), and I guess I’ve developed my own little thread-wiggle. I learned a long time ago that there are usually good, solid, respectable reasons for doing things “the Right way”, and that it’s wonderfully informative and empowering to find out what those underlying reasons are and why they create a “right” way. I also learned along the way that there are thousands of “Right” ways, each dependent upon their own set of assumed or prerequisite conditions, and that when you change one of the assumed conditions, you may well change the status of “right” to “not so right” or even “wrong”. (E.G. Cotton dyes in base ph. Wool dyes in acidic ph. : Cotton is damaged by acidic ph, wool isdamaged by basic ph). And as a trained artist, I learned that it is often useful and beneficial to break the rules, to do things “wrong”. It can serve an aesthetic or practical purpose, and it can provoke people to notice and think about things that they might otherwise take for granted. 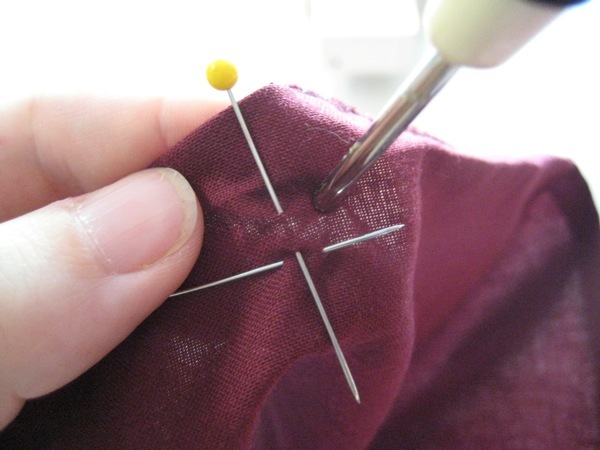 Hi, LadyD – If the eyelets are closing up, there’s a couple things I’ve found that help. First, pull viciously with your stitches. For really stubborn fabrics, I whip around the hole before I start the buttonhole stitches. Sometimes you have to stop half way through the eyelet and poke it with the knitting needle again. Also, for eyelets that came out to small, using thin ribbon for you lace and sewing it to a yarn needle helps with the lacing process. Thank you for this! I’ve been trying to figure out how to hand sew an eyelet, and this is the first tutorial I’ve found that really makes it clear and easy for a beginner. Can’t wait to try it out!